While announcing the initial charge against Smollett last month, Chicago Police Superintendent Eddie Johnson said his department believed that Smollett was also responsible for mailing a threat letter to himself that set the stage for the purported hate crime. Nonetheless, no state charges were brought against Smollett in connection with the letter by the grand jury. The letter has been under investigation by federal authorities including the U.S. Postal Inspection Service and the FBI. The letter hoax should be a federal crime, but the FBI will find Jussie Smollett innocent because THE FBI ARE LIBS/were radicalied Libs by Obama. mpire” actor Jussie Smollett pleaded not guilty Thursday in Cook County court to 16 counts of disorderly conduct for allegedly staging a phony attack and claiming he was the victim of a hate crime. The plea of not guilty to charges of filing a phony police report came after Judge Steven Watkins was randomly assigned to preside over the high-profile case. Jussie Smollett pleaded not guilty on Thursday to charges related to lying to police after the actor claimed earlier this year that he was the victim of a racist and homophobic attack. The "Empire" star pleaded not guilty to 16 felony counts of disorderly conduct for filing a false police report, according to the Chicago Tribune. 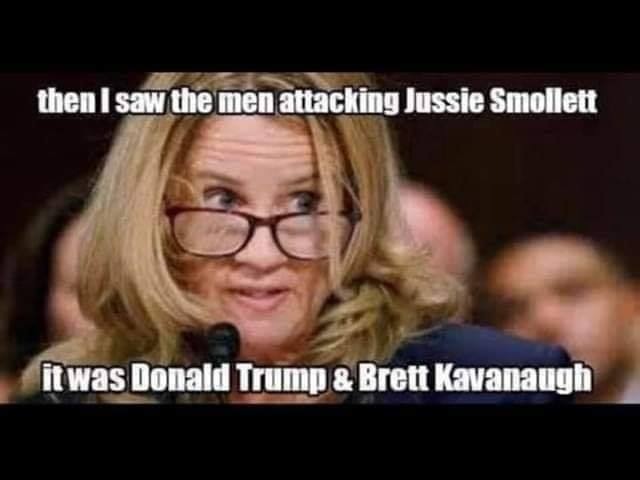 Smollett has maintained his innocence in the case. The Tribune reported that cameras were allowed in the courtroom when a judge was randomly assigned to the case. That judge, Steven Watkins, will ultimately determine whether future proceedings can be recorded in the case. The 36-year-old actor, who is free on $100,000 bond, has previously denied lying to police or faking the attack. Among Smollett’s well-wishers in the courtroom was local activist Frank Chapman of the Chicago Alliance Against Racist and Political Repression, who more typically shows up at the courthouse to support those alleging abuse by Chicago police. Smollett is next due in court on April 17.
jennifer playing a few cards here with her Smoller roller. Yesterday, actor Jussie Smollett entered a plea of not guilty on charges he lied to police in his reports that he was the victim of a hate crime in January. As with the Matthew Shepard case in 1998, the news reports of Smollett’s hate crime claims reignited emotions I’d largely packed away. I followed the story with growing sadness and anger. It curdled into rage as the possibility grew that Smollett’s tale was a hoax. Friends and colleagues tut-tut in horror over antigay violence. But they tend not to know anyone who’s actually been attacked. I know the reality of antigay violence personally, because a 30-year-old shirt reminds me. Hanging toward the back of my closet is a perfectly standard blue Oxford cloth button-down shirt, of the most classic boxy cut. What makes it different from any similar shirt are the bloodstains. The left side above the pocket is soaked through; so is a patch on the right side. Blood is splattered across the collar, shoulders, stomach and sleeves. That was my blood, gushing from my face in October 1992 as a group of angry London teens broke my nose, knocked me unconscious, and kicked me in the face as I lay on the ground. That was my blood, gushing from my face in October 1992 as a group of angry London teens broke my nose, knocked me unconscious, and kicked me in the face. It was pub-closing time. They were drunk, likely after hammering down quick pints to beat the bell. We were a pair of men talking to each other about our life together, our plans, the trip we were starting. “They’re poofs,” I heard. The closest one punched me in the face. My then-partner Bill grew up in a tougher neighborhood than I had. He managed to stay vertical and fight back during the assault. The violence ended only when a taxi turned into the street. Our attackers scattered. The cabbie stopped, and he and Bill managed to get me conscious. We somehow found my bent spectacles on the cobblestones. The two of us had been in England all of three hours. Like any tired couple after a long flight, we had nothing more on our minds than having a bite before getting to bed. We’d gone out to get cash and find a place to eat in the tourist haven of Covent Garden. Instead, we spent our whole night talking to officials under fluorescent lights — first at the police station, then at the hospital. They were unfazed by our wounds and our story. Happens a lot, they said, bent over their paperwork. The police found the attackers nearby, and arrested the three they caught. One of them took a swing at a constable in the van on the way back. They beat him badly, the commanding officer hinted later. I had no reaction, except more fatigue; the lesson would not be learned. The sun had risen by the time we made it to bed. We stayed indoors for a couple of days, nursing our wounds. In the end, we decided to finish our vacation — stitched up, bruised, and aching. Our appearance brought questions everywhere we went. We told our story, nodded at expressions of sympathy, and took the journey to Ireland we’d planned. It wasn’t a joyful trip: Bill was angry, I was morose. We were glad to get back to New York City. I was called to testify against the attackers, in London, on four days’ notice. I couldn’t afford the plane tickets, so the charges were lifted. Our attackers walked free, with whatever damage the police had inflicted. Bill’s face still has a visible scar, more than 25 years later, where he was stitched up from chin to lip that same night. At the request of Britain’s National Health Service, I had waited until we returned home to get my face rebuilt. That meant my U.S. insurance would cover the costs, rather than British taxpayers. The process of having my nose and the center of my face rebuilt is familiar to anyone who watches “Botched”—but I can tell you it’s more painful and exhausting than you would imagine. I was away from work for two weeks, 10 days of it lying flat on my couch, mouth-breathing and medicated. The new contours of my face shocked and disturbed me for months. The effects of concussion took equally long to abate. Slowly, my damaged sense of balance — which at random produced a complete loss of equilibrium with violent, debilitating nausea — started to repair itself. My fears of loud groups of teenagers, of running feet behind me, ebbed over time. I don’t think much about the attack, except when I have to explain its lasting side effects. I can no longer tolerate roller coasters, swinging gondolas, rope bridges, or other places where my equilibrium is violently tested. In quiet chats, I’ve found a few professional colleagues who also cope with the side effects of concussion and head injuries — and that helped more than I expected. I don’t really know why I’ve kept the shirt since 1992. Perhaps it’s to prove that it all really happened, that it was as bad as I recalled, that as the event recedes, I can hang onto physical proof against the doubters. The reality is that my gaybashing was hardly unusual. Bill and I were simply a common statistic: One in three LGBTQ people is physically assaulted for their sexuality at some point in their lives. If our media devoted even a tiny fraction of the attention Smollett’s story received to every LGBTQ person who’s been taunted, threatened, or physically attacked, the volume of actual gay bashing might overwhelm other topics. Instead, this case lends credence to those who cast doubt on hate crimes, question victims, and blame the “looks” or “behavior” or “attitude” of those victims for the violence perpetrated on them by others. While the Smollett case was seemingly a hoax, don’t let it sway you from the cold, hard fact: violence against LGBTQ people — as well as against people of color, women, those of non-Christian religions, and other disfavored groups — is real. And it happens every day. If you don’t believe that, I have a shirt I’d like you to see. Definitely. And whether or not one guy was lying about an attack, 49 others were just gunned down in New Zealand for being Muslim. Edited 3 time(s). Last edit at 03/17/2019 10:22AM by suncloud. People like jennifer have blood on their hands. But since when have kluckers valued life? again racist should be removed.